AlbaTwinMa: Fab job Jo Freya! IanT: Will you do this again on another tour ? thepoozies: who knows they will but maybe not with me. donegal-v-a: where is the bis? donegal-v-a: no classic until now! Devilish Accord: The new CD is brilliant, grabbed mine at Southport show. Devilish Accord: Smashing stuff. Well done ladies, and thank you Jo for being here with us. debhughes2 bought reward: "A signed pre-release copy of the new album, 'Into the Well'"
bought reward: "A signed pre-release copy of the new album, 'Into the Well'"
The ever-adventurous Poozies have toured worldwide in their 26 years, attracting recognition and appreciation for their eclectic choice of material, unusual and exciting arrangements, and heart-tugging vocal harmonies. Founding member Mary Macmaster from Glasgow is at the core of the group, playing a gloriously fat, bassy electro-harp, while long-term member Eilidh Shaw from Taynuilt is a beautifully hypnotic and emotive West Coast fiddler. 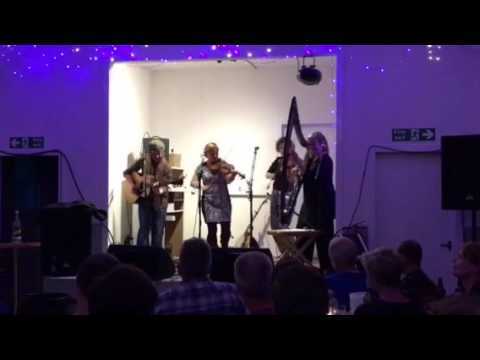 A recent line-up change has seen the addition of Sarah McFadyen from Orkney, who has a laid-back fiddle and 5-string banjo style akin to the North American old-timers, and Tia Files from Oban, who is a phenomenal guitar player and percussionist, and can be powerful and driving or empathetic and soulful as needed. They play a dazzling, joyfully eclectic mix of contemporary and traditional tunes with beefy, powerful accompaniment, while their perfectly executed songs vary dramatically from Gaelic waulking songs to old-time American, country and pop.